I loved the different way in which Cathy had written this story, it really helped to understand Elaine and Ian's view of what happened. This book really touched me personally as my stepson and step daughter both have RAD due to neglect from their mother. My step daughter age 10 has lived with me for the last 8 years now and only sees her mother at the weekend. Whilst there are still neglect and safeguarding issues on a weekly basis, the fact that she has lived with myself and my husband in a home where we put firm boundaries in place has meant that she is mostly a well adjusted young girl. My step son lived with me for 7 years before choosing at age 12 to go live with his mother against the court order. In the 6 months he has been gone he has deteriorated massively. He is now hugely overweight, no longer washes or brushes his teeth, has no boundaries at all and no longer attends school. He has recently become known to the police for criminal damage to buses and trams. We have tried to get him living back with us and he refuses and runs away. Social services are involved with him and his mother but it doesn't seem to have any effect. It is so upsetting to watch. He is so angry, he is physically violent to myself, his mother and his sister and has no conscious or concerns for how he treats people. RAD is awful. Thankfully some children manage to get the help and support they need to turn it around and manage to deal with it to live a happy, healthy life. I've rated this book very high as I set aside some 'me" time to read it and thoroughly enjoyed it. 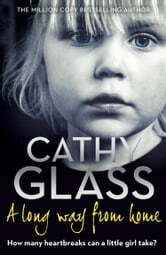 Cathy Glass has this time written the book in a completely different way and for me it was excellent. She is one of my favourite authors and this book did not let her (or me) down. This is an amazing story! There is happiness, sadness. It's all there. And so glad for the happy ending! This book like all of Cathy Glass books hit all of your emotions and the ending was a nice twist. This was a vey intressing book. It brings to light some of the issuses around international adoption. And how one family overcomes thair problums. The story of anna and her tamly is atrue testment of how love helps us face and overcome trubles headon.